This is a question which I come across in an examination. I know the answer and also know the solution. Well when I first saw this problem I didn't know how to approach this problem and I think I will still not be able to predict the correct answer of a question which will be based on this question's type . I am not asking that this is "this" reaction and it must proceed like" this " ,but what I want is how will you approach this problem . What will you think on first look of the problem. What all things you will observe from question and also do write what you think the answer must be . Also BEWARE THIS HAS MULTIPLE ANSWERS CORRECT. I am not telling you the answer because it would be easier to explain that answer . Also, please those who have seen this problem earlier. Please resist yourself from posting answers. The first thing I notice is the hydroxyl group, a very powerful activating group and an ortho-para director. The hydroxyl group is such a strong activator that if you take a solution of phenol and drip bromine into it, the phenol will react with the bromine so rapidly that the bromine color will be immediately removed from the solution as 2,4,6-tribromophenol is formed. The next thing I notice is the very bulky t-butyl group, also an activator, but much milder than hydroxyl and also a mild ortho-para director. Next I notice that the two substituents are arranged meta to one another. There is one position in between the two groups that will be sterically blocked (double-ortho effect); the position on the other side of the t-butyl group will also be sterically blocked, but not as bad. 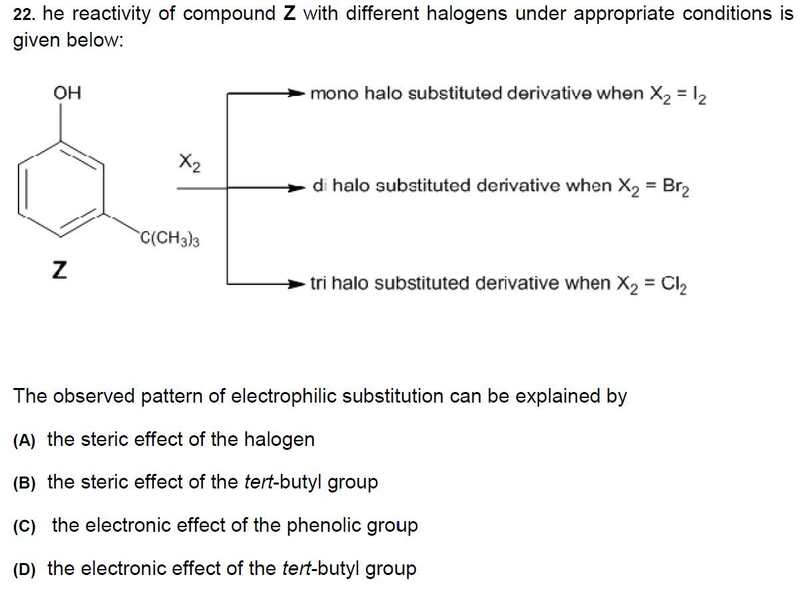 Also the directing effect of the hydroxyl group will overwhelm the directing effect of the t-butyl group. Finally, in the halogen series size increases from chlorine to iodine. In the reaction with iodine, the position ortho to the hydroxyl group and para to the t-butyl group is the only position that is electronically activated and sterically accessible to the bulky iodine. In the reaction with smaller bromine, the position ortho to the hydroxyl and para to the t-butyl and the position para to the hydroxyl and ortho to the t-butyl are electronically activated by both groups and sterically accessible. The "double-ortho" position is still sterically blocked. With the smaller chlorine atom, all 3 positions - even the "double ortho" - position are sterically accessible to the smaller chlorine. Based on this reasoning, I would select answers A, B, and C. I would probably also include D because the results are (weakly) reinforced by the electronic effect of the t-butyl group.